If you’re looking for your next mani project, we’ve got something interesting yet easy-to-do for you. Let’s try geometric nail art. 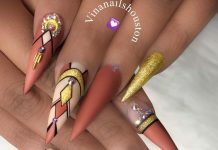 Geometric nail art is one of those nail art designs that look complex and mind-blowing at first. However, once you check out the tutorials, you’ll realize that they’re easy after all. All you need is some nail polish and scotch tape. 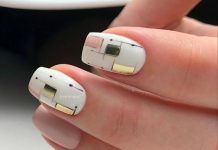 The basic principle to guide you in this design is to paint over your clear scotch tape with the nail polish. First off, you cut up all your tape in prepartion for the task. Then, apply base coat and let it dry. Next is painting on your base color. Once dry, it’s time to use the scotch tape. Position the pieces strategically and by order to get the geometric design you are going for. Paint over the tape and remove while wet. Repeat until your design is done. With geometric and abstract nail art designs, you can use matte, glossy, or glittery nail polish. You can have different shapes and repeating patterns. 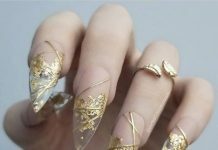 Some creative nail designers get to make ingenious use of negative space. Just check out our collection to see what we mean!